THE ROCKY HORROR SHOW – LIVE! This cult classic musical, with music, lyrics and book by Richard O’Brien, is a humorous tribute to the science fiction and horror B movies of the 1940-1970′s and spawned the film version that created the cult classic genre. It tells the story of a newly engaged couple getting caught in a storm and coming to the home of a mad transvestite scientist unveiling his new creation, a muscle man named Rocky Horror. Time Warp back to 1950’s science fiction, dance to the sounds of rock ‘n’ roll, and follow two college sweethearts on a night out they’ll remember for a very long time… Sharpen your stilettos, fish out your fishnets, and prepared to party with the outrageous mad scientist Frank N. Furter! Complete with sass from the audience and participation props, this deliberately kitschy rock ‘n’ roll sci-fi gothic is more fun than ever. 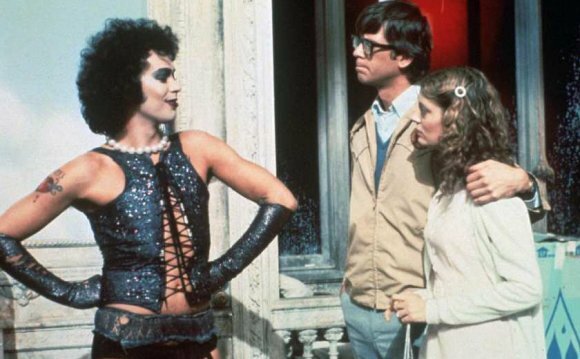 Rocky Horror is as popular now as it was in 1973. It’s one of those shows you MUST SEE at least once, but watch out…those who see it want to see it again and again…Warning – contains rude bits! Participation Props Pouch will be on sale at the theatre to add to your fun and experience of Rocky Horror! (No outside props will be allowed to be brought into the theatre.) Cosplay is encouraged! SPECIAL DISCOUNT: For groups of 10 or more attending the same performance, tickets are only $17.00 each. Tickets must be purchased in the same order and in advance (before door sales) in order to qualify.